Let’s say you have an older synth that backs up its data using an external tape recorder. 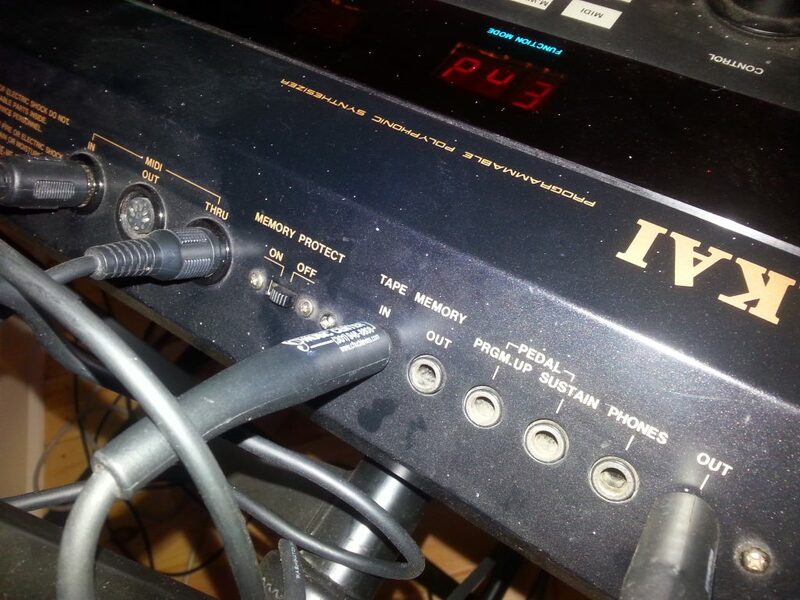 For example, an Akai AX80. And you don’t have a tape recorder. 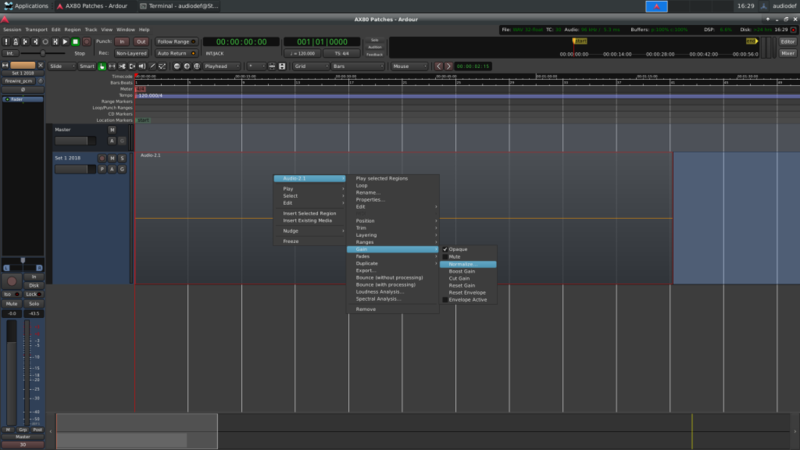 But you do have a modern DAW such as Ardour. I’m going to show you, using these specific examples, how to use Ardour instead of a tape recorder to save your AX80’s data. This is useful if your AX80’s battery is getting low – or is dead. You can either replace it yourself if you have soldering skills, or you can bring it somewhere to have the battery replaced. If you want to do neither, you can save your patches externally and load them later on when you need them. This is also useful in case something happens despite having a good battery and you lose your on-board work. 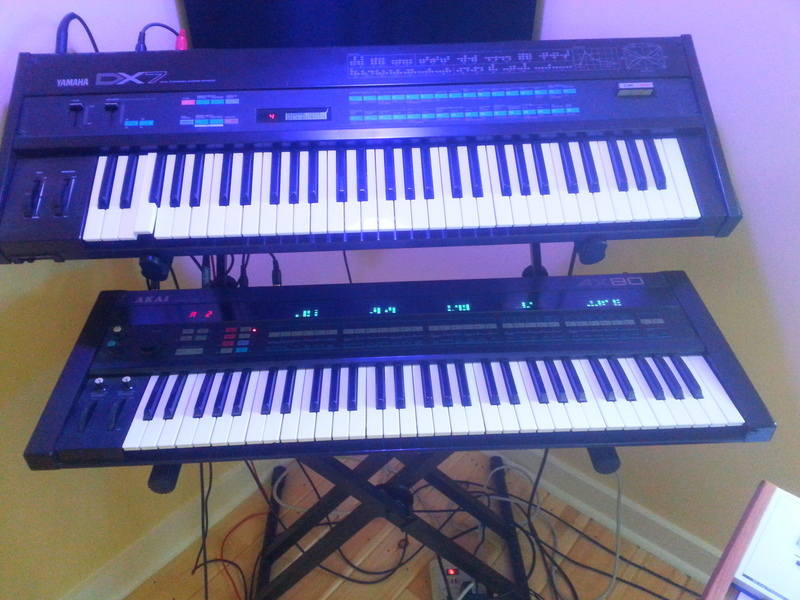 The Akai AX80 in my studio, underneath a DX-7. 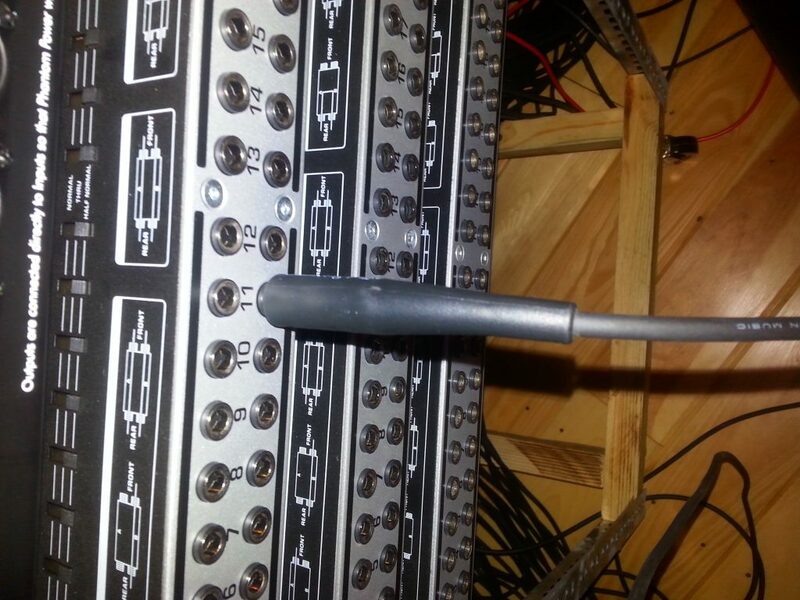 Start by plugging one end of a patch cable into the tape out on the back panel. Rear panel, tape out connected. Then connect the other end of the cable to the input of your sound system. 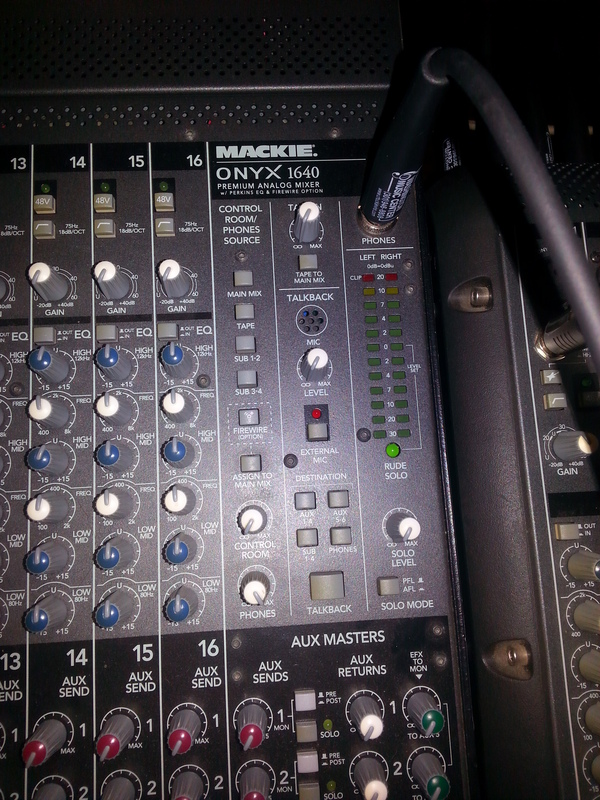 In this example, my mixers are connected to patch bays. I’m plugging the tape out into the same channel that the AX80 is connected to on the rear of this patch bay. 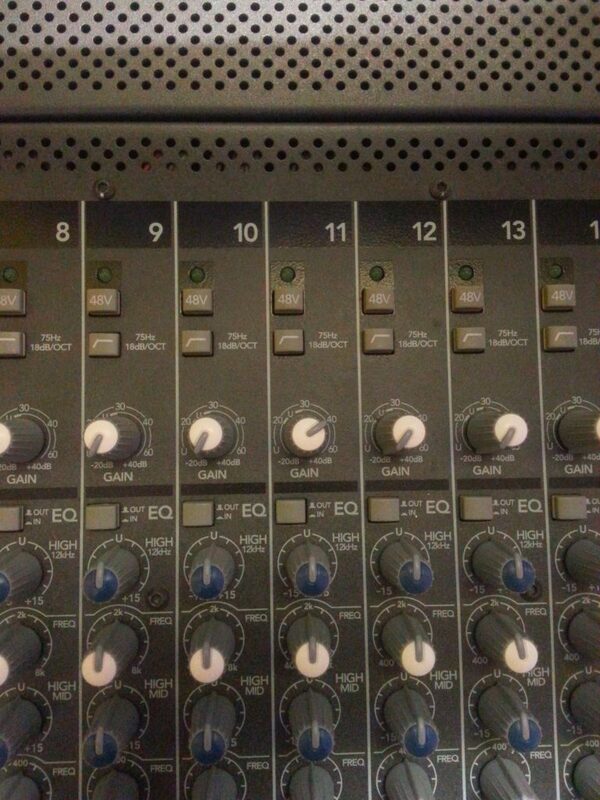 This strip on the bay goes to channel 11 on my mixer. Channel 11 on my mixer. Note that I’ve turned up the gain. 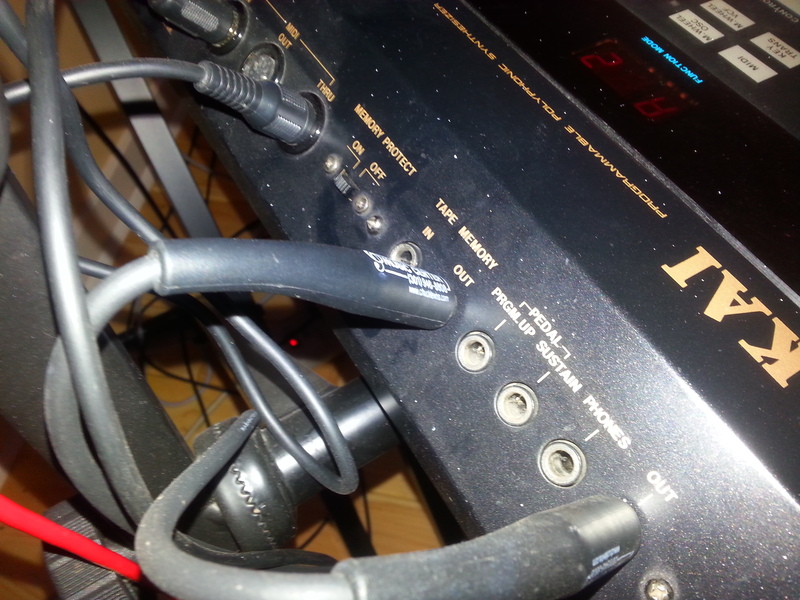 The AX80 outputs its tape backup signal at a very low level. Now that you’re physically connected, open Ardour. You can either create a track with an existing session, so you can save your AX80 patches used in that session with the session, or create an Ardour project specifically for backing up banks of AX80 patches. 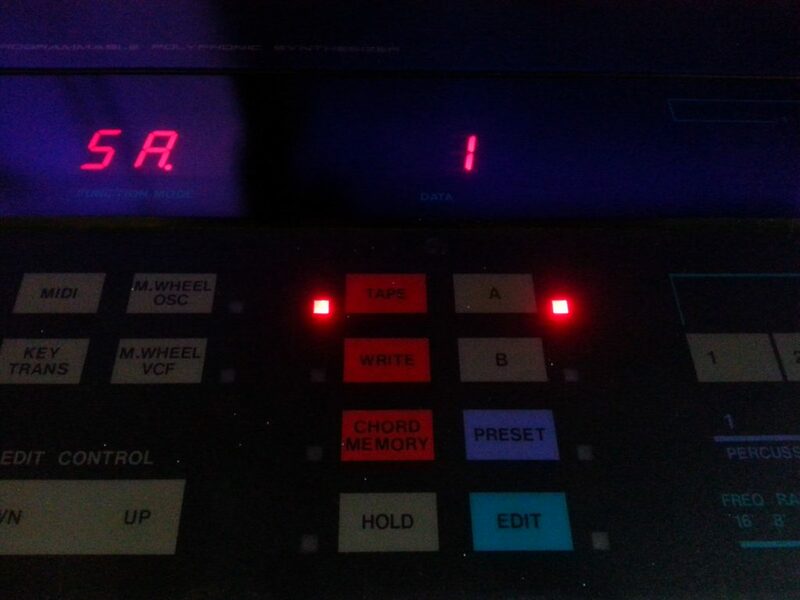 Either way, connect a new track to the channel the AX80 is on, record-arm it, press record, and press play. 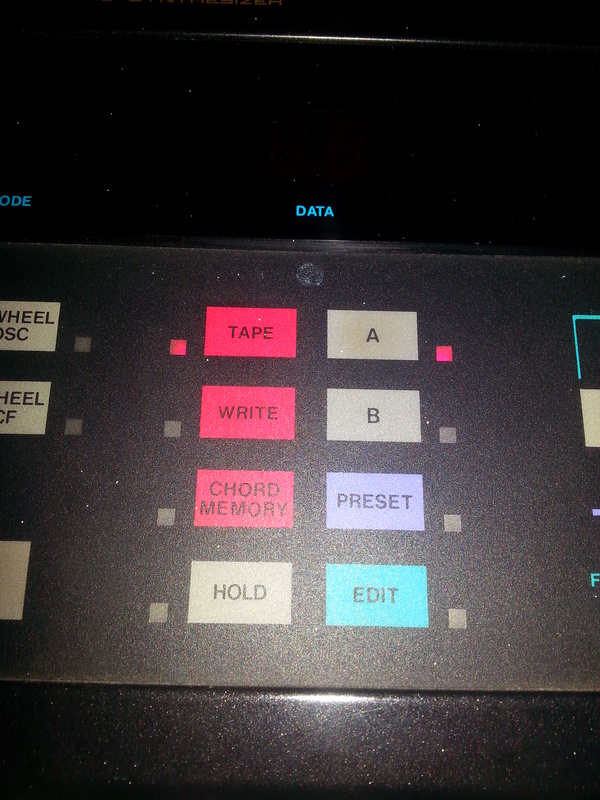 It’s fine if there’s some lead-in while you push the next few buttons on the AX80. Now you want to push the TAPE button on the AX80. Select which bank you want to back up. Now press the 30/SAVE button. Now select a number from 1 to 30 to identify this backup. I’m not sure if this means you can only save/load 30 different backups or if you’re just giving your backups a number for identification. The manual is not clear on that. I do know that this isn’t a patch number. The save saves the entire bank – I’ve tested that. Now go back and hit the 30/SAVE button again. If you’re listening to the AX80’s output, you’ll hear some buzzing – a softer buzz followed by a harsher buzz. I’m guessing the soft buzz is a handshake and the hard buzz is the actual data. 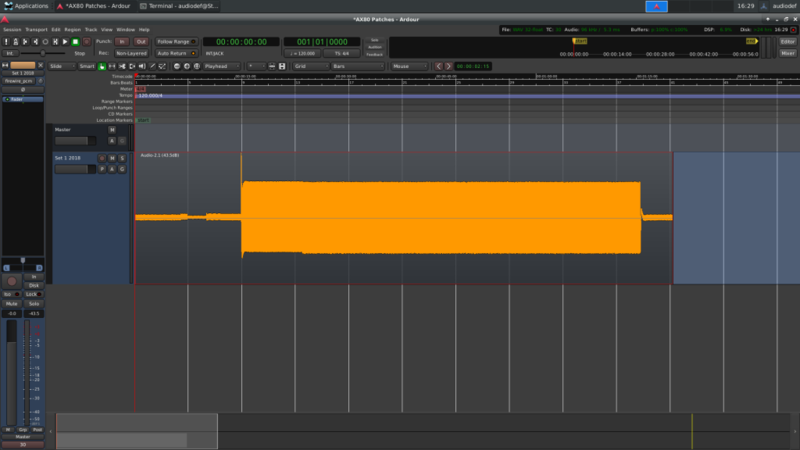 In Ardour, you may see the track meter show some input, but you will not see a waveform. As I said earlier, the level is very low – and this is normal. When the AX80 is done, the screen will read END. 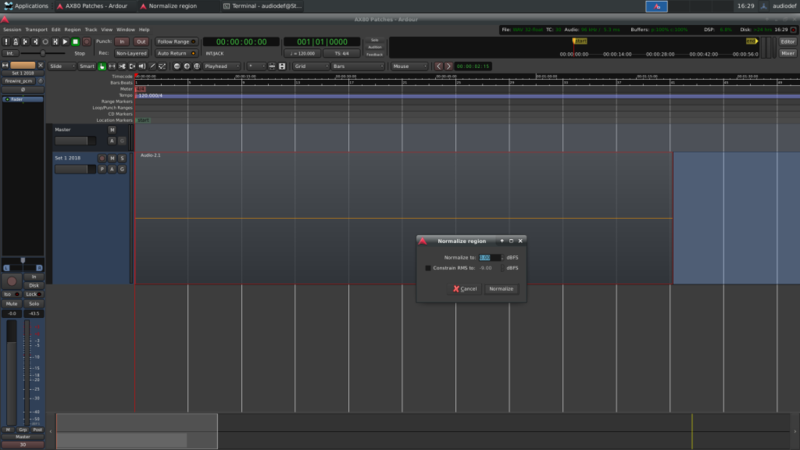 If you want to visually verify the signal in Ardour, you can normalize the region – just undo it before you close the session, because you don’t need, and probably do not want, this signal to be normalized. It looks like there’s nothing here, but the AX80’s tape signal is very low. You can normalize the region to see the AX80’s tape backup signal. Default 0dB normalization is fine just to view it. Now to load your saved backup, you’ll want to plug in the AX80’s tape input. 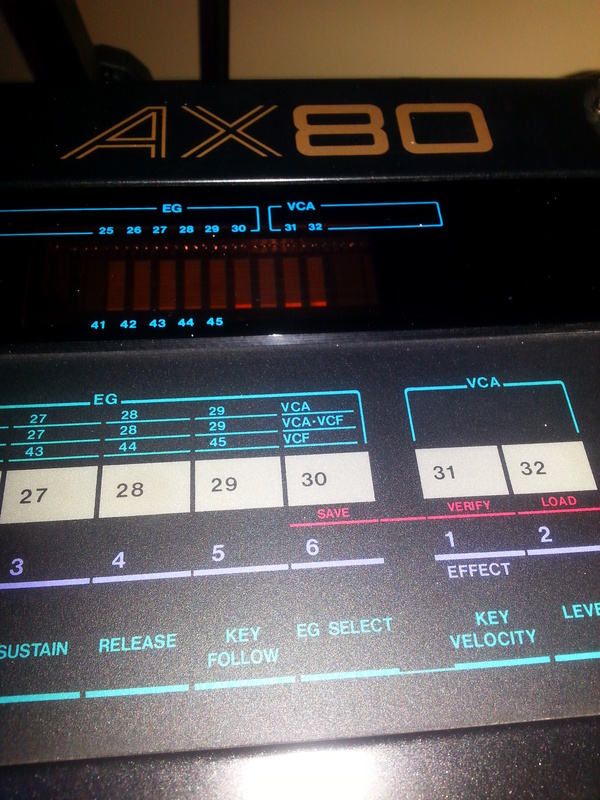 AX80’s tape input. Note that memory protect – the switch to the left – must be set to OFF. The other end of the cable should be plugged into an output from your system. 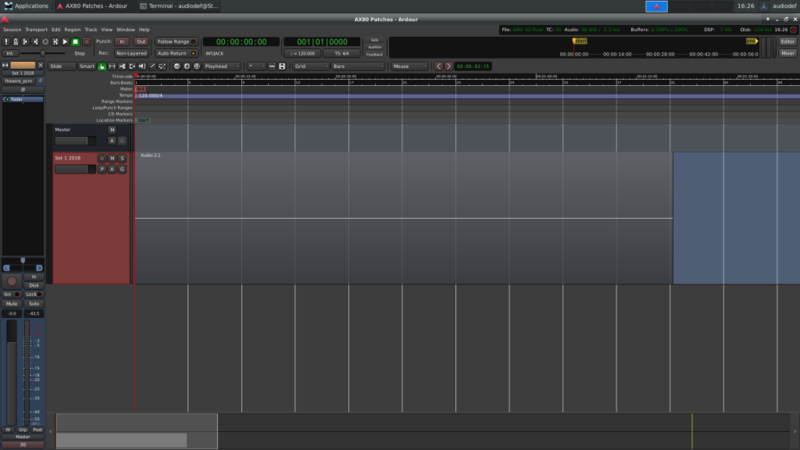 In my example, I’m using the headphone out because this mixer can’t assign outputs to tracks in Ardour. Headphone out to AX80 tape in. Note that I’ve turned up the headphone gain all the way to make sure the AX80 can “hear” it. Make sure you turn the headphone gain down when you’re done. As with saving, you start by pressing the TAPE button. Then go to the section where the 30/SAVE button is and press the 32/LOAD button. Select the number you chose for this backup (1-30) then press the 32/LOAD button again. The AX80 will now wait for a signal. Play the track you just recorded. When the track reaches the signal, you’ll see the AX80’s data display flicker rapidly. When it’s done, the AX80 will read END. I hope you found this helpful. I just happened to look on ebay recently at how the AX80 is doing, and models in good condition are still going for close to $1000. It’s a very nice board.